Since much of this early pottery is not marked, appraisers can determine the age and origin of these pieces by the readily apparent identity which will include determining the type of clay, the form, forming techniques, firing techniques, glazing materials, decorating materials, etc. Much early American pottery was made with red clay (today called redware). 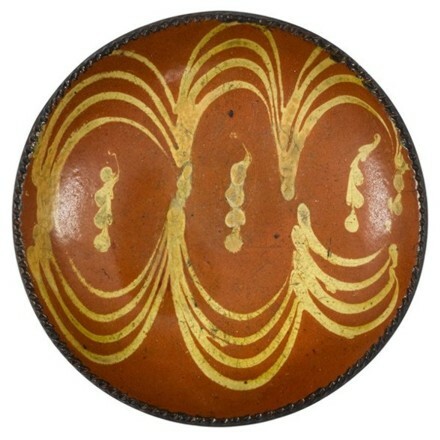 The redware plate shown sold at Pook and Pook Auctions for $550.00. Other countries produce redware, Mexico and Italy for example. This can make identifying American redware difficult. One difference is that clay from these countries are typically not as dense as American red clay and are usually a brighter color. 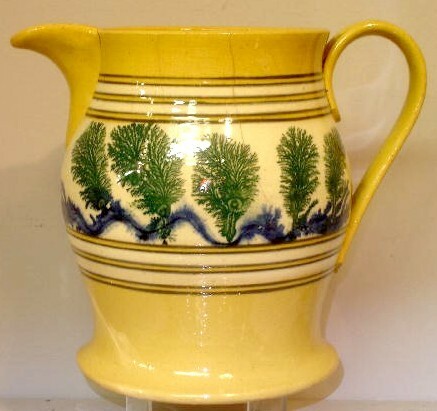 The English yellowware pitcher shown below also has a seaweed pattern. It dates between 1800 and 1850. It sold at auction for $977.00 (photo courtesy of prices4antiques.com). Sometimes pottery looks hand painted when it is actually a print. The oldest process is called transfer printing where a design was made on paper, pressed onto the clay body, then fired in the kiln. The paper burned away leaving the pattern. Since they had to fold the paper in some areas to compensate for the curve of the pottery, transfer printing will often show a white line where the pattern does not quite match. 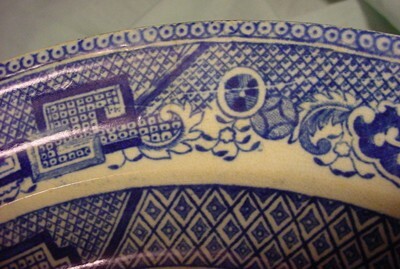 If you look closely near the rim of the plate, you will see a white line running from left to right, identifying this as transfer printed.